As the Director of Watercraft Programs at Mystic Seaport in Mystic, Connecticut, Shannon McKenzie is responsible for the operating vessels at the Museum including schooner Brilliant, the boathouse livery fleet, and the launches. 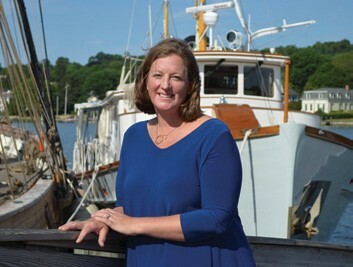 She also manages annual events at Mystic Seaport such as The WoodenBoat Show and the Antique & Classic Boat Rendezvous. She is a licensed captain with a 500-ton offshore ticket and many years of experience in the traditional sailing community. In addition to her work at Mystic Seaport, Shannon also enjoys boating with her family. “Our present boat is an Eastern 19, a center console motorboat that is perfect for operating up and down the Mystic River in the evenings with my family, including our young son who has informed me that he prefers motorboats over sailboats. He told me, ‘Even though you love sailboats, Momma, does not mean that I do,’” she laughs.